This Birmingham-based group was previously known as The Sorcerers and are significant as being the first band to feature the famous and influential rock drummer Cozy Powell. The band was formed in the mid 1960s and included singer Ken Aston, organist Pete Ball, bass guitarist Roy Black, guitarist Chris Moore, and drummer Colin Powell. Pete Ball grew up in a musical family and his older brother Dennis (Denny) was already playing in well known Birmingham singer Danny King’s group The Mayfair Set by the time The Sorcerers were formed. 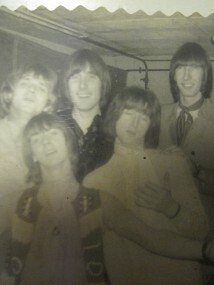 Pete also had another brother Dave who played guitar in a group called The Madding Crowd. Colin “Cozy” Powell was born in the Cotswolds town of Cirencester on December 29, 1947 and started playing drums at an early age. After playing in various local groups, he left school at age 16 to “turn professional” and joined a West Midlands group called The Sorcerers in 1965. Like many British groups at that time, The Sorcerers were soon touring over in Germany where they remained for about three years. The band later accepted an engagement to play at an American Air Force base over in Turkey. While in Germany, The Sorcerers recorded three singles starting in 1966 that were released on various obscure German labels. One track, Baby Lass Uns Tanzen Gehn, was sung in German, while another, Love Is A Beautiful Thing, was a cover of a Young Rascals song. These records are today extremely rare and command high prices. and the first Young Blood single, the energetic Green Light was released in March of that year. Don’t Leave Me In The Dark and credited to Dennis Ball (Pete’s brother) from the Mayfair Set. The Archies Bang-Shang-A-Lang and The Beatles The Continuing Story Of Bungalow Bill from their famous “White Album” double-set. and became restless to find a more suitable outlet for his powerful drumming style. By late 1968, he had left the group to join a new band that was being put together by Pete Ball’s brother Dennis from The Mayfair set. The new group was to feature ex-Move bass guitarist Chris “Ace” Kefford as lead vocalist (see the Ace Kefford Stand). of the Ace Kefford Stand along with his brother Denny Ball. Oh … forgot Dave was in Chicago Hush after Madding Crowd … and then there was Big Sister … but don’t remember much. I think I was drunk. Just a few details Keith. Dave, Denny (well Den to me!) and Pete Ball were in the Rockin Perfidias – renamed The Deadbeats 1963 (Midland Beat Group contestents – the year Carl W and the Vikings won (well, the Fewtrils ran the comp – go figure). Den and Pete went to Some Other Guys (renamed the Roustabouts – played with the Elvis film round Brum). Dave played in Thomas Pauls Blues Disciples, The Little People, then Madding Crowd (Germany 66-ish). Pete to Jules & the Ghost Squad, then Veldens, then Sorcerers, then Young Blood, then Big Bertha (with Dave & Den) then various cabaret acts before heading to South Africa with Copperfield – where he stayed. Denny went from Deadbeats through Roustabouts to Danny King and the Jesters / Mayfair Set. (Brum, then Germany). Cozy was in Germany with Casey Jones & the Governors when the Sorcerers nobbled him and brought him back to Brum. Then Young blood. Cozy Dave & Den did BBC Radio as a 3 piece called ‘Ideal Milk’ around 67 I guess. Then came Ace Kefford Stand, then Big Bertha (Cozy Dave Den & Pete), then Cozy to Beck, Dave to Procol Harum and Denny to Long John Baldry. Dave Left Procol and joined Baldry (with Den). Cozy went from Beck to Spirit, and then phoned Dave and said ‘let’s do the 3 piece thing’. This became Bedlam. Cozy had a hit and a Top of the Pops which basically killed Bedlam. Denny carried on playing with all sorts and Dave joined the Army. Well, that’s SOME of the details …. Hi, I just want to set the record straight, The Sorcerers were formed in ca. 1961, we turned pro in 1963 after auditioning for a club in Kiel/Germany called the Star Palast Klub. We moved on from there to various places doing month long gigs. We ‘nobbled’ Cozy Powell in ca. 1964, and he came out from England to join us when we were playing at a night club in Fulda, Germany. Shortly after this he got homesick and returned to England. As I recall, it was Roy Black that arranged this because he had played with Cozy in Young Blood at an earlier time. Hi I knew the guys in Formula 1 band many years ago whose singer Ken Price left to join Young Blood. Lost contact years ago but just read that Ken died a few years ago. Surprised to hear that. When did he die? I believe he went to live in one of the Canary Islands? Hope he settled down, got married and had a family? Sorry to hear iof his passing. Makes you realise how time has flown by! !